I started this book before bed one night and well lets just say it was a late night by the time I put the book down. The author took me on such a roller coaster ride that was adrenaline based and had me on the edge of my seat for most of the night . The story line alone had me hooked . A young woman Siobhan is trying to figure out what happened to her mother . After seeing a nun who looked like her mother hang herself . That is the first piece of the puzzle that Siobhan must solve to in the mystery of why her mother disappeared 6 years prior . The pat that Siobhan travels down is dark and scary, armed with only the confession of her mother and the mysterious prayer hidden within the words on the paper . Siobhan is in grave danger and she must outsmart her mother's enemies and save the world from ultimate destruction . The characters are very well written and complex. Siobhan is a fighter and doesn't stop until she has all the answers she needs . She finds more about her history as she reads her mother's confession . The monks are well lets just say evil . They want the confession back and will do any thing it takes to get it back . The characters will have you cheering for them in Siobhan's case and wanting to kill them yourselves as in the monks case . The author does such a great job mixing the historical part of the story and what is happening in the real life of Siobhan . The book takes off like a bat out of hell and doesn't stop the roller coaster ride . The author takes us on a journey of epic proportions . The twists and turns are every where. You think you have it figured out and bam the author takes you in a totally different direction . The author did a great deal of research to keep this book as accurate as it is. The mixture of the thirteenth history and the real up to date time. The way the author describes everything has you actually seeing the monasteries in your mind as you read The book is part the historian . part the Da Vinci Code and The Omen all rolled into one great read . So if you like a great book that will keep you reading all night long and take you away to a place that will have you thinking all night long . 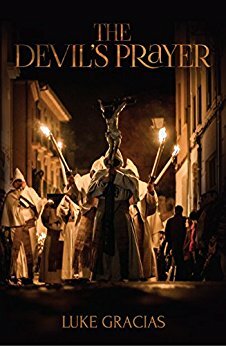 Check out THE DEVIL'S PRAYER you will not be disappointed .